Google announced that it's firing another shot in the continuing cloud computing price war. The technology giant said it is cutting the prices of all Google Compute Engine Instance types across the board. This drop in price comes just weeks after Amazon surprised investors by announcing that its similar AWS cloud computing platform generated $4.6 billion in sales and $265 million in profit. Amazon Web Services (AWS) is currently the largest provider of cloud computing services. However, Google stated that this price cut is actually just following through on last year's commitment to have its cloud pricing follow Moore's Law. The specific amount of price cut depends upon which configuration is used. In the U.S., the biggest price cut was for the Micro level at 30 percent. Standard configuration pricing was cut 20 percent. Both High Memory and Small pricing levels were reduced 15 percent. The smallest price cut was on the High CPU configuration, which received a 5 percent deduction. According to the company's pricing calculator, with the cuts, the cheapest Micro instance running 24 hours per day would cost $4.09 for a month, or a $0.006 effective hourly rate, while the cheapest High CPU price would be $38.84 per month, or an effective hourly rate of $0.053. Google announced that price reductions in Europe and Asia were "similar." 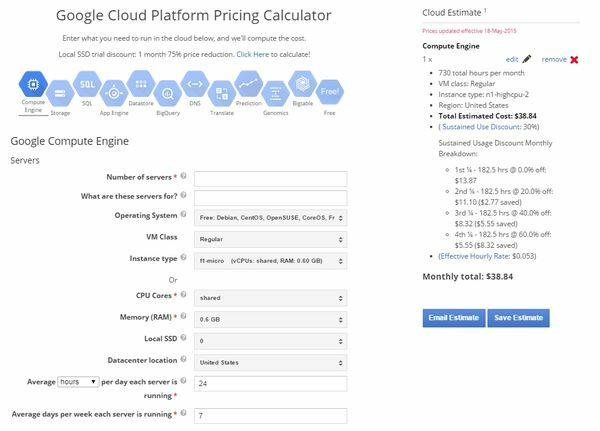 According to the company, combined with features such as per-minute billing and automatic discounts, these new prices make the Google Cloud Platform up to 40 percent less expensive than its competitors for many workload types. With these latest pricing cuts, Google claims to have driven down computing cost by more than 56 percent in the last 24 months. For new customers exploring the company's offerings, Google Cloud Platform offers a free trial in the form of a $300 credit for up to 60 days.